There are some cases where urgent notifications are important, like a Twitter direct message, a new e-mail in your business inbox, or breaking news on a particular topic. Boxcar has been a popular notification dashboard on your iOS device, and more recently, the Web—now the company wants to keep you in the know on your Mac too. Boxcar is bringing its own notification abilities and “inbox” approach to the Mac as a menubar utility. For some time, Boxcar has allowed you to add and customize alerts for a variety of services including e-mail, Twitter, Twitter search keywords, location check-ins, Google Voice SMS and voicemail, good old fashioned RSS feeds, and more. These alerts are sent to each device you register with Boxcar (though, thankfully, you can set quiet times if you don’t want to be disturbed at certain hours), which now includes your Mac. Being a beta, Boxcar’s first public shot at a Mac client isn’t quite done yet. 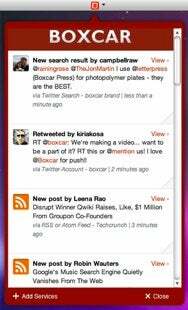 For example, while you can reply to Twitter messages from Boxcar’s menu bar icon, adding a new service requires a trip to your browser or picking up an iOS device. And while Boxcar is probably the first real competitor on the Mac to open-source notification system Growl, there is more than a bit of irony to the fact that this initial beta actually uses Growl to display alerts (for more crossing-the-streams fun, you can actually pipe your Mac’s Growl alerts to iOS devices through Boxcar). However, Boxcar CEO Jonathan George told Macworld that Growl will be dropped from a future Boxcar beta in favor of a home-grown alert display interface. George also told Macworld that his company plans to make Boxcar’s Mac client more intelligent in the way it handles alerts and interacts with your other registered devices. For example, if your Mac’s screensaver kicks in, alerts can be silenced on that device, but still sent to your iPhone.